We have a private event on 10/24 and won't be downtown! In the fall, at the end of the season, I went to a farmer I work with for some squash and whatever else she could give me. I was expecting squash, garlic, potatoes, and maybe some Swiss chard. She sold me all of those things plus had some turnips, radishes and a lot of mustard greens. I haven’t done a lot with mustard greens, eating or cooking. I have treated them like collard greens before, slow braising with bacon and cider, but these were tenderer than collards and really beautiful. She just had too many and not enough people wanted them at the market. I told her I didn’t have a plan for them, but I would give it a shot. When I got them back to the kitchen I washed and tasted them. BOOM! Horseradish! Sharp, tangy horseradish flavor that wasn’t too spicy but bright and fresh. I knew I had to do something special with them. I decided to go for a pesto. Pesto is usually basil, garlic, lemon, olive oil, pine nuts, and Parmesan cheese. Also salt and pepper, but that *almost* goes without saying. I have done different versions in the past, changing the ingredients based on what was seasonally available and for different flavor profiles. Examples include walnut pesto (subbed for pine nuts) or zucchini pesto (zucchini in addition to the standard recipe.) A good rule of thumb is: change one thing at a time. The result will still resemble pesto but be a little different (no need to reinvent the wheel). I usually follow this advice, but for these mustard greens I stepped a little further outside the box. I completely replaced the basil with the greens and instead of pine nuts I used pepitas otherwise known as green pumpkin seeds. Pine nuts to me have a little bit of a sharp flavor and since I was getting a bit more sharpness from the mustard greens I wanted to go with something nuttier. It also helps that I had pepitas on hand, but I like their sweetness also. I think pecans might have been a good substitute in a pinch as well. Once I had a rough idea of what I wanted to do, it was just a matter of processing everything together. I make pesto in a food processor. The professional version is the brand Robot Coupe, but any large bowl food processor will work. Kitchen Aid makes a nice one and everything comes apart for easy cleaning which is super helpful. Also a microplane for the lemon zest is easiest and a great tool to have not only for zest but for fresh nutmeg or hard cheeses. 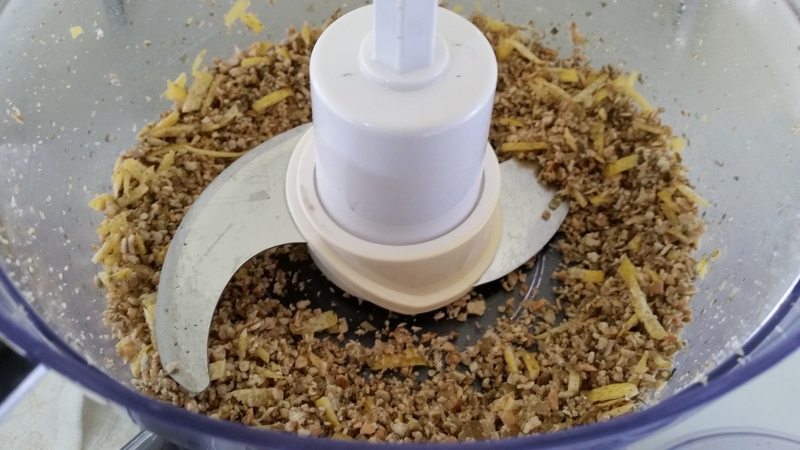 If you don’t have one, you can use a zester or peeler to get the lemon zest, just be careful not to get much of the white pith as it is bitter and not in a good way. 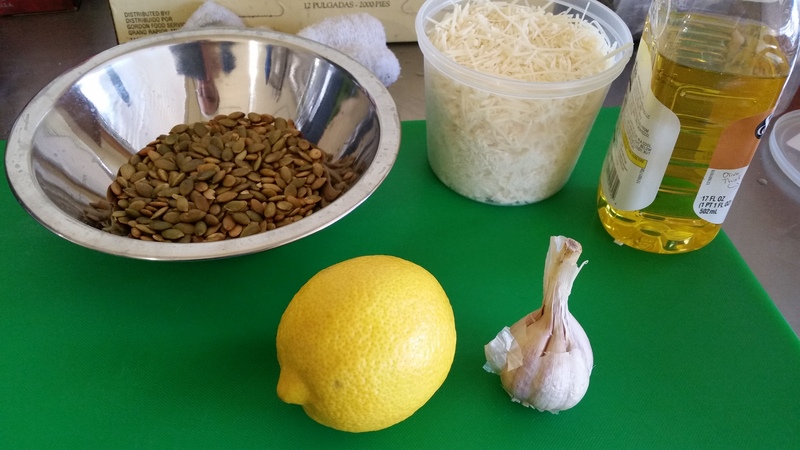 Start with the nuts, garlic and lemon zest in the processor with a pinch of salt. Pulse until finely minced. Then add the greens. You may need to add them in batches and scrape the sides down with a silicone spatula. If it won’t all fit, scoop some into a separate bowl, it can be mixed together at the end. Add the lemon juice and the cheese and pulse to combine. Stream in the oil while the food processor is running but be sure not to keep it running too long once the oil is in. You don’t want the oil to get too hot as it can also become bitter. Once the oil is in, taste and adjust the salt and pepper. Salt and acid are very subjective. If you aren’t sure if a recipe needs more salt or acid, take a dollop on a spoon. Put a few grains of salt on it and see if it improved the flavor or if it is too much. Still not sure, try a drop of lemon juice and see what you think. It only takes a tiny amount of salt or acid at a time. After some practice with this, it will be easier to tell. Also salt isn’t always the answer. Pretty frequently if a dish is “just missing something” a little fresh lemon or some vinegar brightens it up and gives it the depth it needs. Once the pesto is finished, use it right away or freeze it either in zip-top freezer bags or in a FoodSaver vacuum system. Just be careful not to vacuum the bag so tightly that the pesto mushes out before it has a chance to seal. Follow the manufacturer’s directions. This should keep in the freezer for several months. On the cart, I like to mix this pesto into the eggs for the frittatas with vegetables like roasted butternut squash or on a sandwich with some ham. 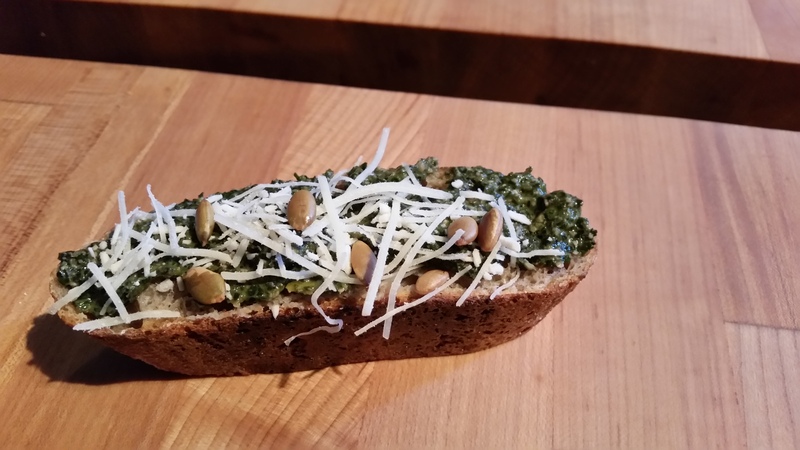 It’s also great on a crostini with parmesan (with more pepitas) as a quick easy appetizer. The big take away I got from this experience was be willing to go for it. 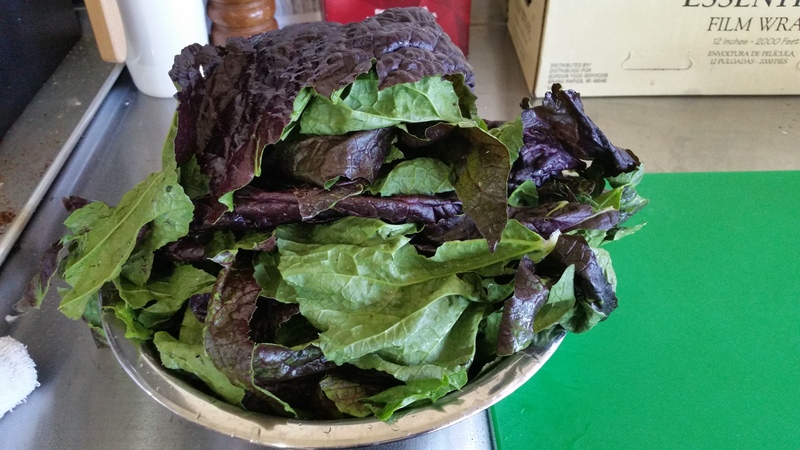 I didn’t know what I was going to do with those mustard greens when I drove away from the farm. I tasted them and had an idea that ended up working out great. If it hadn’t worked out great, I still would have learned something and I would have been out a little time and a little money. Sometimes making mistakes is part of the fun. I know lots of great home cooks who get really anxious when not following a recipe to the letter. Cooking is like painting or sculpting, not photography or chiseling. You can usually fix problems that arise or it just becomes something new. If you can go with the flow, taste along the way and have a solid foundation to build off of … anything is possible. Launched in August of 2016, we serve tasty breakfast and coffee in downtown Madison while focusing on farmers' overstock produce and minimal waste. Keep your eyes peeled! We will be at Let's Eat Out neighborhood dinners Wednesday and Thursday evenings! Changes will be posted daily on our facebook page. Have a special event coming up? Serve breakfast! Worried not everyone will get it? We can plan a custom menu just for you. Contact us today!